Kendall Jenner, Kim Kardashian – Kanye West, Demi Lovato, Amy Schumer and many other celebrities take to the streets to March For Our Lives. Hundreds of thousands of people around America gathered together, in force, in New York, LA and DC on Saturday’s March For Our Lives rally. The event was organized by the students and survivors from the recent infamous Parkland high school deadly gun shooting which killed 17 students. The objective of the rally was to call for stricter laws surrounding the procurement of weapons and to put an end to gun violence. Singer Miley Cyrus sang “The Climb,” holding “Never Again” sign. 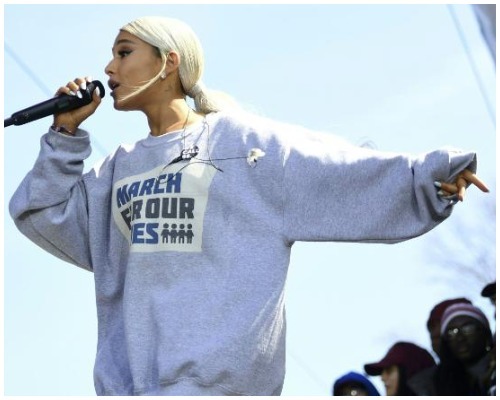 Ariana Grande wore a sweat which was carved “March For Our Lives” for her on-stage song performance “Be Alright” . Singers Common, Lin-Manuel Miranda and Ben Platt too joined in support of March For Our Lives at Washington DC. They also paid tribute to the 17 lives lost in the deadly school shooting in Parkland, Florida, with their on-stage performance. Singer Ariana Grande sings at the March for Our Lives rally in Washington. Singer Jennifer Hudson appeared onstage at the March For Our Lives rally in Washington who lost her mother, brother and nephew to gun violence in 2008. She along with students from Stoneman Douglas, chanted “We want change!” in chorus. 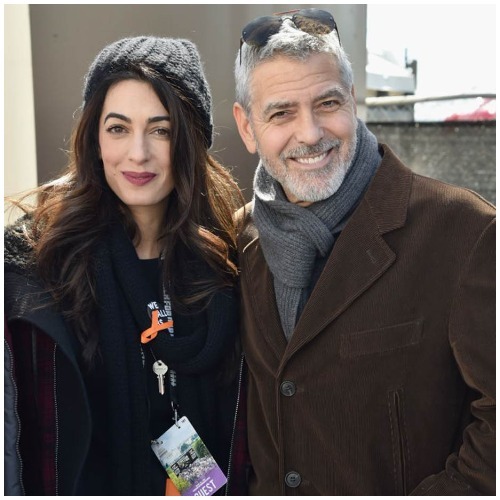 George Clooney with wife Amal Clooney not only supported the rally for stricter gun control but also donated a generous $500,000 to the event. Celebrities Oprah Winfrey and Steven Spielberg were among the others who provided their support at Washington rally which had an estimated crowd of 500,000. Oprah too donated the same amount of money as Clooney. Reality TV star Kim Kardashian with her rapper husband Kanye West and daughter North walked the rally in Washington and shared the pic on her Instagram account. Singer Paul McCartney supported March For Our Lives in New-York. Comedian Amy Schumer joined from LA with Kendall Jenner. Schumer is an outspoken gun control advocate since a deadly 2015 shooting at a screening of her film “Trainwreck.”. I’m so proud of you all!! @kendalljenner @c.syresmith @haileybaldwin @marchforourlives #MarchForOurLives #NeverAgain #MarchOn #Repost @cosmopolitan ・・・ Yesterday at the #MarchForOurLives in LA ? “You see that, politicians? You can make a little less money and be able to look at yourself in the mirror with no blood on your hands,” Schumer added. Hope the huge crowd of march will awake the politicians in America and call for a strict action against guns and weapons.